FREE CMA Home Evaluation Report WITH THIS COUPON. HUGUENOT Beautiful fully renovated ranch on 60x100 lot. 3 bedroom location on quiet tree lined street. Hardwood floors, brand new tiled baths, custom kitchen. Full basement $619,900 plus attic. Looking to Sell Your Home for Top Dollar? Call William and Fanny. 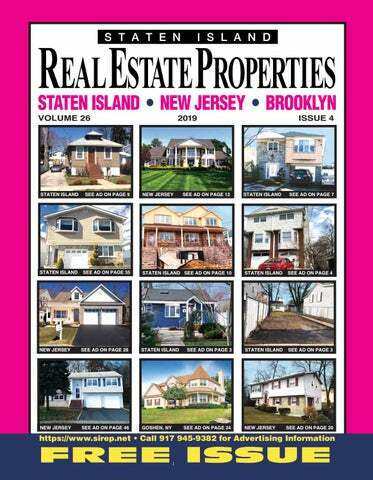 Staten Island Board of Realtors Top Producers from 2005-2016. Experienced Agents with the most knowledge of the market. Call us today, close with us tomorrow. We speak Hakanese, Mandarin, Cantonese & Taisainese! Attention investors, builders and buyers: South Shore - OPPORTUNITY awaits to own a FULLY DETACHED home on a 25’ x 135’ property at a discounted price. Repair existing home or rebuild a larger home as instructed by your architect; either way a great investment. Property is very near transportation and shopping in Great Kills. Act fast. Will not last!!! Priced for a quick sale. GREAT KILLS Beautifully renovated ranch on 40 x 90 property with front, side and back yards. Home is located on a charming country street, featuring young 17 x 13 kitchen and 2 bathrooms. Brand new siding, windows, gutters, 2 storm doors, furnace, roof and gas BBQ. Full finished basement. All appliances stay. Beautiful gazebo. House can possibly be extended; check with architect. Near local and express buses to NYC and shopping. Will not last! FIRST TIME BUYER SPECIALISTS! HABLAMOS ESPANOL WESTERLEIGH 8 Room 4 Bedroom 3 Bathroom Semi w/ Baseboard Hot Water Heat! 1st floor with side door entry and opens to a family room, 3/4 bathroom & 4th bedroom. 2nd floor has a large eat-in kitchen w/ sgd to deck & large backyard, formal dining room, living room & 1/2 bathroom. 3rd floor offers master bedroom, full bathroom, 2nd bedroom, 3rd bedroom & pull down stairs to attic. HEARTLAND VILLAGE Move right into this oversized hi ranch 2 family w/ extra large basement & high ceilings. Property is oversized 30x143 and house is 22x57, New kitchen & baths, large kitchen, LR/DR combo. Master has 3/4 $768,000 bath. Nothing to do but unpack! TOTTENVILLE 4 BR, 4 bath Colonial featuring 9 ft. ceilings, custom crown moldings, hardwood floors throughout, granite counters, custom kitchen, full fin bsmt with 3/4 bath & side door to yard, all on an oversized 56x112 irreg. lot backing up to open space. $989,900 Call for info. MIDLAND BEACH Great opportunity to own a business plus a lot next door. Very pedestrian neighbor$924,900 hood, close to transportation. 1,250 (min) & 1,250 sq ft + available all store sizes. Many stores available Woodrow Plaza Shopping Center. TOTTENVILLE Unique, all brick, 2 family colonial, 4 BR, 5 baths finished basement, 2 car garage & parking for 6 cars on 13,000 SF of property. Level 1 boasts a two story great room w/FPL, FDR, spacious kit. w/ island, dinette, laundry, 3 season This House is Deceiving-room, yard w/pool & garOver 3200 SF Lot is 13,000 SF den. 1st fl & 2nd fl MBR suites & 5 zone baseboard heat, 2 zone a/c, 3 zone radiant heat under tile, high ceilings, HW fls & recessed lighting complete this level. Bsmt features enormous family room, bath, storage, utility & two bedroom apt. Can be an 8 over 5 room $1,025,000 house. Close to schools & transportation. OAKWOOD, NEW DORP BEACH Bright & airy, move in ready, one family detached ranch with finished basement on 4,000 sq. ft. of property. Home has spacious living room & dining room with hardwood fls thruout, eat in tiled kitchen, 3 BR with great closets & 2 baths. Basement is finished w/ great room, laundry, ¾ bath & storage. Park like yard is perfect for entertaining. Walk to stores and transportation. BAY TERRACE 3 BR 1 bath single family ranch home. 1st floor entry foyer w/large coat closet, formal living room & DR w/HW fls, EIK, MBR, 2 additional bedrms & full bath. All 3 BRs w/HW fl. Bsmt w/ laundry & utility areas, tremendous amount of storage space. Side door from kitchen leads to lg yard, perfect for outdoor entertaining. On oversized lot, nearly 5000 SF. Walk to SI Rail Road, minutes drive to shopping along Amboy Rd & Clark Ave.
DONGAN HILLS-BELOW Unpack your bags & move in. Beautiful HW fls thruout, 12’ ceilings in bsmt, parking in driveway for 7 cars & ingrnd pool. Huge florida rm, sliders to yard & big porch on 1st floor. 3 bedrm rental unit w/2 full baths & lg balcony. Express & local buses steps away as is shopping. NEW DORP New 1 fam det 1st flr, fully tiled, open concept. 2nd lev lrg foyer & up few steps to liv room, din room, EIK w/sliders to huge deck same width as house. Half bath & utility room. 3rd lev: mstr bdr w/ priv ¾ bath & WIC. Add’l 2 bdrs, ½ bath & lndry room. SOUTH BEACH Brand new 1 fam semi feat full fin bsmt, ¾ bath, utility room & lndry rm. Lev 1: foyer, closet, 2 steps into liv rm, din rm, ½ bath, EIK w/ sliding glass doors to deck. Lev 2: 3 bdrs & full bath. S.E. ANNADALE Magnificent fully renovated 4-5 BR center hall colonial home. House is tremendous & features a great wide open layout, high ceilings, amazing MBR suite, exquisite high end beautiful cust kit, drvwy w/ 3 car grg, enormous unfin bsmt w/ many possibilities & more! ROSEBANK Beautiful det home feat full fin bsmnt, 3/4 bath, side door. Level 1: Closet, Living room, EIK, 1/2 bath, family room, rec room, sliding doors to deck. Level 2: Master bedroom with 3/4 bath, bedroom, bedroom, full bath. Commuters delight! OAKWOOD Excellent location, beautiful 2 family home. Corner property w/ 3 parking spots, custom kitchen w/ granite counter tops and island, hardwood floors, custom made closets. No flood insurance required. GREAT KILLS Fully reno’d prop feat cust kit w/ stainless steel app, slid drs to lrg deck, roomy liv rm w/ nat light, & half bath. Master bedrm w/ large closets, 2 more bedrms w/ strg space & full bth w/ dbl sink. Fin bsmnt w/sep ent. HW flrs. Large yard w/ pool. GRANT CITY Just built this over-sized 1 family semi has lots to offer! Conveniently located on dead end street, this beautiful house features 3 BR, 1 full bath, a ¾ bath and a ½ bath, large spacious rooms w/ HW fls, granite counter-tops, 2 car driveway lots of storage and much more! NEW DORP Buyer friendly priced end unit condo. Near shopping and transport (train, express and local buses) Level 1: bedroom, family room, 1/2 bath, foyer, garage, laundry room. Level 2: Living/dining room combo, gallery kitchen, master bath, master bedroom. GRANT CITY Great opportunity for investors! Solid block, brick structure of 2008, 2 medical offices (waiting room, reception + 10 rooms each)+ (2 bedroom) apartments on the 2nd floor. Best location by New Dorp above Hylan Blvd. Close to all transportation. DONGAN HILLS Gorgeous, bright and airy rare find 2 family in prime location of prestigious Dongan Hills Colony. Built in 1998 w/beautiful un-obstructed ocean views. Master suite w/terrace, HW flrs thruout, newer kit, new SS appls, newly paved backyard, w/ingrnd pool & more. EMERSON HILL Lrg 1 fam 4-bdr cent hall col home in excellent move in cond w/ cust upgrds. Feat HW flrs, high ceilings, big rooms, tasteful trims & finishes, high end mod kit, mstr bdr suite, fin bsmt w/sauna, 2 car garage, in-grnd pool, paved yard; much more! SOUTH BEACH Unique open concept ranch features 1800 SF of living space! Large foyer, huge open LR, DR & EIK w/ easy access to the to the deck, patio & in ground pool. MBR w/ walk in closet, 2 additional bedrooms, 1 full baths, full finished basement with a ¾ bath. BAY TERRACE Beautiful multi-level townhouse will not last long! This home features hardwood floors throughout, skylight in the family room. Big eat in kitchen with granite kitchen counter tops and stainless steel appliances. Big backyard w/ pavers. Full fin bsmt w/ sliders to yard. SUNSET HILL Magnificent 3 BR solid colonial home in exc move in cond. Desired old world charm & character as well a modern feel. Solid HW flrs, all big rooms, wide open fl plan, high end kit and appl, lg MBR, WB FPL, multi zone HW heating, huge attic & more! TOTTENVILE Gorgeous home located on the quiet street in highly desirable part of tottenville. Home is fully renovated with large l-shaped backyard, new tiled bathrooms, hardwood flrs, beautiful kitchen w/granite countertop, stainless steel appliances & more! Please Call or Email If You Are Thinking of Selling or Buying...or Send Others Our Way… Thank You! NEW DORP Do you own or manage a small business? Looking for office space w/great visibility on HYLAN Blvd...? This is it! Call your Realtor now for an appt. 2nd fl unit. Bright & airy. $1,650 Mo. I would like to take this opportunity to thank you for a job extremely well done. .... The house was sold within a few days for even a little more. Your salesperson, TINA Tina Rivera, was responsible for RIVERA the sale made in record time. ..... she demonstrated an extremely high level of professionalism, particularly in regard to staying in communication with me every step of the process. .... During 40+ years of rental property ownership, I have never been as impressed with a real estate salesperson as I am with Ms. Rivera. I look forward to allowing you and Ms. Rivera to market other properties in the near future. Sincerely, Frederick F.
Client Reviews My husband and I had the great pleasure of working with your R.E. company when we purchased our beautiful home. Our real estate agent was Marilyn MARILYN Augustyne... AUGUSTYNE Marilyn was absolutely amazing! ... pleasure to work with...Marilyn made our experience a pleasure....a true professional, easy to talk to, down to earth and has a beautiful heart. Her patience and passion for work is not easily found. Not only did she find us a beautiful home but she has become a life long friend. Marilyn, we think the world of you & recommend you to everyone looking to buy a home. Sincerely, Robert, Jennifer & Leah L.
My husband and I just recently sold our home through Rayann Besser Realty. We had the pleasure of having Laura Krause as the realtor handling our LAURA sale. KRAUSE She was available every step of the way and went above and beyond what we could have expected at all times. We highly recommend her to anyone looking to buy or sell their home. Sincerely, Joyce and Anthony M.
Build to suit, new beach home in a private beachfront community. Work directly with the builder for your dream home with 4BR, 2.5BA, custom kitchen pkg, HW flrs, 10â&#x20AC;&#x2122; ceilings, multiple decks w/spiral staircase to rooftop deck. Still time to pick colors & upgrades! Gorgeous 10 room, 5BR, 3.5BA brick front on culde-sac with beautiful landscaping, sprinklers, paver walkway & view of Taylor Lake. Double door entry to a 2-story foyer w/butterfly staircase, gourmet kit, sunken FR plus a full high basement and 3 car side entry garage. Gorgeous 5 BR 3 1/2 BA brick front home on large corner lot w/ fenced in yard, ingrnd pool, deck, full fin bsm; 2 car side garage! 1st fl open layout, 2 story foyer, large LR, FDR, fam rm w/ WBFPL, gourmet kitchen w/ upgraded cabinets & breakfast area, office, MBR suite w/ BA & WIC. Custom, 3BR, 2BA ranch in Four Seasons, a 55+ community. Expanded Martinique model w/bright & airy sunroom, vaulted ceiling great room, hardwood floors, rec lighting, crown molding, designer kitchen & walk up attic. Close to clubhouse, gym, billiard, card & crafts room. Beautifully expanded 5 BR, 3BA custom home with extra bds & bath in lower level. This meticulously kept beauty has a gourmet kitchen w/10 ft multi-level island, open floor plan with great room, family room, fireplace and 2 tiered deck in huge yard with fenced-in pool. Gorgeous redone home w/ beautiful landscaping, paver walkway/driveway, 2 car garage, Fiberon deck w/electric awning; full bsmt! LR, FDR, gourmet kit w/upgraded cabinets, granite counters, SS appls & breakfast area, fam rm w/gas FPL, office/5th BR, MBR w/ pvt BA & 2 WICs! Sandburg built in 2007 on cul de sac. Gorgeous private fenced lot w/ view of lake & backs to Green Acres. Large deck. Expanded kitchen w/ cabinets, SS appls, pantry family rm w/full wall brick WBFPL. Entire downstairs is Granite. MBR suite/sitting rm. Move in ready. Beautiful home. 4BR, 2.5BA colonial in Whittier Oaks West w/ recent improvements includes the eat in kicthen, main bath, powder rm, furnace & roof. HW floors thruout LR & DR + all bedrooms. Full basement, nice yard & great location directly across from park. PRIDE of OWNERSHIP!â&#x20AC;&#x2C6;Well maintained, updated 4 BR, 2.5 BA Sandburg model in desirable Whittier Oaks East. Large remodeled EIK w/ granite counters, tiled backsplash, SS appl & sliding door. Fam rm w/ cozy WBFPL & HW fl. Newer roof, windows replaced, heat & A/C. Rare Monmouth Heights 5BR, 3BA ranch w/ walk-out bsmt, stunning MBR w/vaulted ceilings, fireplace & newer kitchen. Also, new HW, HVAC, roof, gutters, driveway, garage doors, paver porch & patio plus private backyard all in the perfect central location! Priced to Sell! newly renovated colonial with over $50,000 in recent upgrades located on premium lot in heart of Manalapan. 4 BR, 2 1/2 BA, brand new kitchen w/ quartz counters, white cabinetry, SS appls & glass tile backsplash. Sliders to LG deck & yard. Convenient to NYC Bus, shopping. Expanded CHC on corner lot in Monmouth Heights. With over 500 sq ft addition, this upgraded 3BR, 2.5BA col features a newer open granite kit, large FR w/gas frpl, French doors & 3 season enclosed patio. Large flat yard and 2 car garage close to shopping & NYC transport. Gorgeous redone home inside & out with paver patio & garage on large treed corner lot! Beautiful landscaping, upgraded front door, LR, FDR, spacious fam rm w/ WBFPL, gourmet kitchen w/upgraded cabinets, granite counters & SS appls, large MBR w/ WIC & full BA, 3 addâ&#x20AC;&#x2122;l BRs. HURRY to this desirable Breckenridge 2307 SF Townhome model. Elevator, ground floor bonus room w/exit to porch, 2 BR, 2 full BA's & 2 1/2 BA's. HW fls thruout foyer & EIK w/center island. LR has gas FPL & entrance to deck. MBR w/ vaulted ceiling, 2 WIC. MBA. One car Garage. SHORE to please! 2 story 2 BR, 1 full BA both on 2nd fl & X large 2 car garage just 3 blocks from BEACH! Fin attic for great storage space. Wood stove, pellet stove & new propane furnace 2018. Kitchen will feature all NEW SS appls for new owner. Sellers can offer quick closing. Be in for SUMMER! Desirable Adelphia Greens. Large eat in kitchen w/open layout to LR/DR. 2 bedroom w/loft-can be office/den. Newer carpeting on 2nd level. Master bath w/double sinks, shower stall & whirlpool tub. Plenty of closet space. Just move in & unpack! Great for commuters. Great opportunity to own your own big frog custom t-shirts & more of Monmouth direct to garment printing franchise. Big Frog is a custom printing & design company and is on the list of Fortune 500 businesses. This location is one of the top stores in the country. Looking for move-in ready - this is it!! Oversized entry foyer w/double coat closet flanked by fam. rm on left & laundry/utility rm on right. New kit. w/ SS appls & sink, HW Birch cabinetry, breakfast bar, granite countertops, tiled backsplash. Beautiful HW fls. New oak banisters & wrought iron spindles. 3 BR end unit in desirable Knob Hill on premium lot backing to woods. Family rm w/vaulted ceilings & gas FPL, opens to kitchen w/eat in area to patio. Great sized DR & LR for entertaining. Kitchen w/newer SS appls; corian counters. MBR suite w/ his/her WIC, BA w/whirlpool tub & stall shower. Beautiful colonial located in A section of Strathmore. Large EIK w/ SGD to back yard. Family rm off kitchen â&#x20AC;&#x201C; great for entertaining. Formal DR & LR. Utility rm w/washer, dryer & newer HWH. 4 spacious BR & 2 full baths. Close to transit to NYC & GSP. Jersey shore beaches only half hour away. Pride of ownership shows in this beautifully renovated 3BR townhouse in Randallwood. Well maintained w/ updated kitchen, hardwood floors, renovated baths, upstairs laundry room and roof is 6 yrs old. Convenient to NYC transport, shopping, restaurants & the shore! Lovely first floor, 2BR, 2BA condo in Society Hill with a granite kitchen with full appliance package, updated baths, crown molding thruout, patio & additional storage closet. Community offers clubhouse, pool, tennis & basketball courts. WESTERLEIGH (#4537) Gorgeous! 3 BR, 2 BA colonial updated inside & out! New EIK & BAs, LR/DR combo, new c/a/heating syst. HW fl thru out. Drop stairway to large floored attic. Fin bsmt w/1/2 BA. 18 x 18 screen house. Lg yard w/ patio. $599,900 SILVER LAKE (#4525) Pre Construction Sale! 2 gorgeous custom 1 fam detached homes offer 2 story entry foyer, 4 BR, 4 BA, MBR suite w/ pvt fb and WIC, eat in island kitchen, FR w/ FPL & SGD to lg yard w/ deck. built in garage, full fin bsmt, exit to side yard plus more! Buyer has choice of kitchen cabinets, counters, bath Upper Brackets tiles. Custom built 4 bedroom, 3 bath colonial with open layout totally upgraded with all amenities. $929,000 Call for more information!! close to transportation & shopping all custom • Includes features: open layout, fireplace, hardwood floors, state of the art kitchens & spa baths. w/ quartz & granite Master bedrm suite w/spa shower w/ multiple shower heads and walk in closet Finished walk out basement w/ 3/4 bath Gas fireplace Very convenient location! NORTH OR SOUTH, BIG OR SMALL. WE SELL THEM ALL! OAKWOOD Turn key Subway franchise. Across the street from Oakwood Heights train station, ample parking in $99,000 a strip mall. GRANITEVILLE Large 2 family detached corner property with lots of space and updates throughout! All furniture, appliances and security system is included in the sale of the home. TISHONDA WALKER Accessible to SI expressway and NJ NYS Lic RE $690,000 Mass Transit. PORT RICHMOND Two family detached home. The main unit has 3 bedrooms. First floor apartment has 2 bedrooms and 1 bath. Minutes from the Bayonne Bridge. Great invest$488,000 ment property. SUNNYSIDE Location, Location, Location! Nothing to do but unpack your bags & make this your home. Move right into this airy & bright 2 family semi attached home located minutes from the VZ bridge. WESTERLEIGH Run Don't Walk to this stunning 3 bedroom colonial on a gorgeous tree lined block in Westerleigh. This 3 bedroom 2 bath home features hardwood floors throughout, beautiful moldings, 2 zone heat, 6 ductless AC units, a granite kitchen, and more!! PRINCES BAY 2 Family Detached. Better Than New! Completely renovated top to bottom. Legal 2 family, sep. utilities for ea. apt. quartz counters & SS appls, HW floors thruout. 1st fl: 2 BR & f/fin/bsmt, 1 full & 1 3/4 BA. Basement w/sep side entrance for privacy. 2nd fl has 3 BR & fully fin attic for x storage. Call for viewing! NEW DORP To Be Built! 6/6 two family detached. Each unit will feature 3 bedrooms, 2 bath rooms, hardwood floors and granite kitchens. SUNSET HILL Welcome Home to 34 Harvest Ave a one of a kind 2 family in the heart of prestigious Sunset Hill. Corner property consists of brick & new cedar shake vinyl, new roof & new solar panels. 1st floor of main house contains hardwood floors throughout. Custom open layout kitchen. So much to list! ANNADALE Beautiful Over-Sized Semi with Great Curb Appeal! Large eat-in kitchen w/ tile flrs & counter-tops, stainless steel appliances, gas stove/oven plus additional electric double wall oven. Door to fenced yard with in-ground pool. Heart of GREAT KILLS Beautiful 2 BR Condo! 1 Level open layout, granite countertop kit. w/ss appls. LR/DR combo, 9 ft ceilings, HW fls, lg BRs, full marble jacuzzi BA, c/a, w/d, storage rm, intercom, elevator & garbage room on ea. fl. Assigned parking. Close to all transportation, shopping & restaurants. Must See!! **Tax Abated Until 2024*** No Pets... Service Dogs Allowed Only! SUNSET HILL This Beautiful Home Deserves A Standing Ovation! Nestled in Sunset Hill between Matthews and Harvest Avenues, you will not want to miss this. Traditional Staten Island North Shore Charm at its best. This home has 3 bedrooms upstairs and 1 bedroom downstairs, and 4 gorgeous bathrooms. Call for private viewing and more info! TOTTENVILE Welcome To This One Of A Kind exceptional two family center hall colonial nestled on over 10,000 square feet of land in prime Tottenville location. Four bedrooms / Four baths, Amenities galore. Call for Private viewing of this luxury home. CHARLESTON Welcome to the Tides at Charleston! This Oceanic Model is a rare corner unit, with outstanding features. Full, fin basement, eat in kitchen w/ granite counters & stainless steel appliances. Private location on a 1.69 acre lot with the ability to be at the shore beaches, shopping and major highways within minutes. An hour commute to Philly, Atlantic City and NYC. This 4700+ masterpiece of a home was custom built, with no detail left undone is situated at the end of the street with the private drive leading to a three car garage. On a quiet cul-de-sac, beautiful 5bd/2.5ba updated Colonial sits on sprawling fenced lot. Pretty EIK w/center island. All 5bds are on 2nd level. Master bd has en-suite ba. Backyard has 27` Trex deck, AG pool & firepit. NORTH DOVER - GRANDE WOODLANDS WEST: Fabulous updated 3 bedrm 2.5 bathroom Colonial. Newer renovated eat-in-kitchen. Family room w/wood burning fireplace. Wood floors. All bathrms have been updated. 2nd level laundry room. Full basement has finished room w/ closet. Screened-in deck. Fenced backyard. 2-car garage. FOUR SEASONS @ METEDECONK LAKES 55+: Beautiful 2450sf 3 bd/2 ba CAPTIVA ROYALE model on sprawling .22 acre corner lot. Wood floors & dual-sided gas f/place in both Living Room & Family Room. Gorgeous EIK w/ quartz counter & s-steel appl. Large walk-up Bonus Room. 2-car garage. Situated in beautiful Grande Woodlands this handsome, immaculate CHC, 2 story entrance foyer features both FDR w/butler pantry & FLR, breakfast nook next to a modern kitchen w/granite counters, modern appliances & tile backsplash. Family rm w/ WBFPL & newer Andersen sliders to large deck and fenced in sprinkled backyard. Near desireable Brick Reservoir. Contemporary, fully updated home w/state of the art kitchen appls in Gourmet EIK, top quality wood cabinets, granite counter tops & center island. Wall FPL in open & airy LR. Skylights, large windows provide natural sunlight. All updated bathrms. Family rm w/ FPL & sunrm next to kitchen w/sliders to yard deck & pool. LOCATION LOCATION! Spectacular Barnegat Bay views from every room but 1. Fabulous front porch. Built in 1869, custom Victorian was totally REBUILT in 2007. 3 levels. 4 BR, 3 full BA. Custom crown molding, HW flring thru out. Wainscotting and fireplace from original house. Must See! $299,000 MILLSTONE, NJ Location Location Build your dream house on the 12.66 acre parcel. Just across from the new amazing park. Beautiful Colonial in Lovely Georgetown. Features tons of upgrades. 4 BR 2.5 BA. FLR & DR Great Room with Full wall WBFPL & slider leading to huge yard w/ pavered patio. Lot size is 100 x150. TOTALLY renovated EIK w/ granite counter tops, SS appliances. Great size Master Bedroom w/ WIC an renovated full bath and walk in shower. CASTLETON CORNERS Gorgeous 2 bed- TOTTENVILLE Coming Soon! Beautiful room & 2 bath Colonial with garage and home on tremendous lot. Land lovers large private driveway. Many upgrades! must see! TRAVIS Great 3 bedroom home on 50x100 lot. Walk to stores and buses. Minutes to Expressway. Orange County.... Still Only 50 Miles to NYC! Live With More Space Amidst Beautiful Nature, Friendly Faces and Fresh Air! GOSHEN, NY A grand 5 bedroom 3.5 bath Colonial with an incredible wrap-around porch in the coveted Harness Estates! This beautifully landscaped home is loaded with upgrades: recessed lights, butler’s pantry, French pocket doors, crown molding, etc. With 3,358 square $475,000 feet, this is not a home to overlook! GOSHEN, NY WOW! A brand new sun-filled Colonial, with 4 bedrooms, 3 baths and an open floor plan! You don’t find many of these in the village of Goshen…especially with a covered front porch, back deck and oversized garage. This open floor plan will spark your $409,900 imagination, give us a call today! Always “GO” With Griffith Olivero! COLTS NECK, NJ Located on a winding cul de sac.4 bedrooms, 2 1/2 baths, dining room, living room, family room with gas burning fireplace and updated kitchen. Pella bow windows in family and living rooms. Hardwood floors $709,950 throughout. Dry basement. HAZLET, NJ Custom Center Hall Colonial 4 BR, 2/1 baths, 2 car garage, Paver walkway & backyard patio w/ 12 person firepit w/outdoor kitchen/gas bbq, sink, & frig., vinyl siding. HW flring in foyer w designer shadow boxes, Great rm/DR combo & fam rm. DR w/ sliding drs out yard to paver patio. Gourmet Kitchen w/ S/S appls, granite, glass tile $519,000 backsplash, & ceramic floor, pantry. ROSSVILLE Located near new shopping plaza, movie studio + West Shore Expressway is 5,500’ space available. Call me for further details. Be Sure To Read My Bio www.sirep.net Servicing SI, Bklyn & NYC areas. PRINCES BAY 17059R One Family with 4 bedrooms loaded w/old world craftsmanship, original wood trim, 2 fireplaces, pocket doors, full basement plus many upgrades. $700s Call Ann for further details. TOTTENVILLE 18265R Beautiful Two Family SHC w/ 1 BR rental. Main unit 4 BR, LR, DR, EIK, Family rm, Mbdrm w/WIC + 3/4 bath on 36x154 lot! $959,999 Call me for further details. ANNADALE 18264R Beautiful 6/6 Two Family loaded w/custom features. Ea. unit LR/DR, EIK, MBR w/3/4 BA + WIC, 2 add’l BR, full BA, f/fin/bsmt. $979,999 Call me for further details. TOTTENVILLE 18647H Stunning One Family colonial w/4 bedrms, 4 bath, full finished basement, situated on 87x113 lot! FLR, FDR, eat in kitchen, Maids quarters + garage. Call for details. ELTINGVILLE 18656H Near all 2 family w/3 bedrooms + 1 bedroom rental, full finished basement, 4 zone hot water heat, hardwood floors, master bedroom w/bath. WESTERLEIGH 19157H Gorgeous, beautifully renovated 3 bdrm, 2 bath Ranch on 60x100 lot w/det/garage. NEW f/fin/bsmt, updated eat in $649,900 kitchen, Liv, Din + much more. WESTERLEIGH 18418H Great professional/medical building on 50x143 lot in convenient locale. Features handicap ramp/entrance, 4 rms, BA, c/a. All utilities included. $3,300 monthly. Call me for further details! PT RICHMOND 19055H Great area for restaurant. Features basement + full kitchen, 18 tables, karaoke + dancing! Call me for further details. ELM PARK 18629H Great space for commercial use. 40x90 lot. Call for me further details! WILLOWBROOK 19003H Zone R3-1 – 20x80 lot. Call me for further details! SHEEPSHEAD BAY / MARINE PARK Store Front located on corner of Nostrand Avenue – 1,040 sq ft - $3,600 per month. RICHMOND TOWN 19139H Spacious side by side 2 Family home on 80x166 park like property. One bdrm rental, 3 bdrms in main unit w/2 baths, newly EIK w/Quartz, SS appls, f/bsmt, det/2 car garage! TOTTENVILLE 18587H 2 Fam CHC w/4 BR, 3 BA + 1 BR rental. Loaded w/well appointed amenities incl. FLR, FDR, EIK w/butlers pantry, granite island, SS appls, office/den, sunken fam rm w/ FPL, MBR w/full Jacuzzi bath + WIC, full fin bsmt, HW + radiant heat, custom crown molding, Trex deck, ingrnd pool. eady “I’m R ork To W u!” For Yo ou Thank Y r u o For Y ss! e n i Bus SOLD! "IF YOU NEED TO SELL YOUR HOME, CALL ME TODAY"
NEW DORP Prime professional office/retail space available for lease features 2,000 sq ft located on first floor w/ basement. Great location w/parking lot! $3,500 monthly..... Call Matt for further details. The most trusted name in Real Estate! 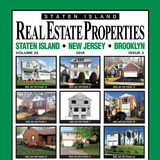 Servicing Buyers & Sellers in Brooklyn & Staten Island for over 25 years! Lot For Sale 50 x 100! Looking to build your dream home? prime location 50x100 R3x lot for sale facing golf course. City sewers in street. Call Dom for more info. Land Lease! Owner is looking to land lease this property. Very busy hi visibility intersection Victory Boulevard & Richmond Avenue. Exquisite Builder’s Home...Best of Everything! This all brick custom built home features 5 bedrooms, grand 2 story mahogany circular staircase, maple custom kitchen, windows, doors & trim. 10 ft. ceilings, inground pool, maid’s quarters, elevator, 3 fireplaces, 6 car garage, on cul de sac. Must see. So much more! Upper Brackets! Office Space For Rent! 4 Rooms. Busy location! List & Sell Your Home With Me & Let Me Help You Buy A Home in N.J. Call Brian today for all of your Real Estate needs! GREAT KILLS 1 Family Semi with living room/ dining room combo, 3 bedrooms, eat in kitchen, 2 baths, finished basement set on $539,000 dead end street. HUGUENOT Bedroom 2 Bathroom Immaculate End unit townhome with backyard. Recent Heating & AC replacement. Hardwood floors, Eat in kitchen with granite tops. 3D tour link $399,999 available please give is a call. As a recipient of a Exit Realty Corp Silver Award 2018 I ask you to help me achieve GOLD next year. It will be my honor to serve you. Call me for a free private consultation today!! Copyright © 2019 Staten Island Real Estate Properties, Inc. All Rights Reserved. Unauthorized Reproduction In Any Manner Is Prohibited Without The Publisher’s Written Consent. This Applies To All Design, Graphics, Layout & Editorial Content. We Don’t Claim To Be The Biggest, But We Certainly Strive To Be The Best! TWO NEW Compensation Models... You may already qualify for the 100% plan. 80% and 70% (NO monthly fees) Schedule a totally confidential meeting. We stress educational, professional and personal development. Work for yourself NOT by yourself. Individual and small group coaching/training. Combined Designations and Certifications below indicate level of professionalism. CBR, CIPS, CRS, GREEN, GRI, MCNE, SRES, SRS, AHWD, ePro and SFR. Members of BNYMLS, SIBOR (Staten Island) MLS, REBNY, LIBOR and NYStateMLS. PRINCESS BAY 2 Family beautiful Renovated studio to 3 bedroom con- Center Hall Colonial on private dead dos next to train & shops. Elevator end street, in sought after Princess Bay. 4 bedrooms & 3 baths. Must see! building with available parking. Ask for Vivian Kokkinos Call for details. GRANT CITY CONDOS FOR SALE GRAND OPENING! Features 4-bedrooms, master bedroom with 4-piece bath, family room with fireplace, custom kitchen with peninsular Island, granite countertops, stainless steel appliances, crown moldings, custom trim work, wide plank hardwood floors, 9 ft ceilings, hot water heating, interior and exterior lighting package, detached garage, separate 1-bedroom apartment with hookups. Builder has C of O, Immediate Delivery! Great family home on quiet street in Richmondtown, near shopping great school and transportation. 4 bedrooms with plenty of closet space, master bedroom has a walk in closet and private bathroom. this home sits on a corner property with a huge back yard and pool. This home has solar power that will save on your electric bill. Come see this house and make it your home. Great 2 family home in the heart of Tottenville, near shopping and transportation. 3 nice size bedrooms, master bedroom has a walk in closet and full bath. Hardwood floors throughout, formal living room has a fireplace. Studio apartment with a full bath. Great yard for entertaining. Come and see this home! Beautiful 3 BR home, finished bsmt, two full baths and one half bath. Near transportation and shopping. Heating system hot water system about 5 yrs old and the roof is less than two years old. One family home, 3 Bedrms, full, 3/4 & 1/2 baths, closed in porch leading to deck w/ above ground pool, finished basement, central & and many other extras. Home also has a Generic Generator. Come & check out this huge colonial home on a large piece of property. 5 BR, 3 BA, crown molding, oak fls, open porch & full fin bsmt. 5 fireplaces. Come and see this piece of history before it is gone. www.5manchester.com FLEMINGTON, NJ 3 bedroom townhouse in highly desirable Flemington South Estates. Full EIK, Large LR & garage entrance on 1st level. 3 BR & 2 full baths on the 2nd level. Full basement ready for finishing. This is a Homepath Reduced! $264,000 Property. Toni Lynn Kirby OAKWOOD Beautiful 3 BR, 2 Fam hi-ranch in 917 921-9236 prime location. Home has so much to offer. DONGAN HILLS-BH Just Listed! Mint two family semi. Newer roof, large kitchen with granite, island, stainless steel appliances. 4 bedrooms plus 1 bedroom apartment. Trex deck, Andersen win$699,000 dows plus so much more. TOTTENVILLE Sprawling 4 BR, 5 bath, custom French style Colonial in Tottenville. Truly one of a kind. Grand entry, 2 FPL, 2 story great room, amazing backyard + so much more. SUNNYSIDE Commercial bldg sold PRINCES BAY 6 BR, 2 family Beauty. as package with ranch next door. Every amenity imagineable. ComPrime location. Off of Staten Island pletely custom thruout. $1,249,000 Expressway. 8,772 sq ft lot with parking for 15 cars. Plus 2 BR apt. BULLS HEAD Beautiful 2 family semi on 21x150 lot. Main unit has 3 BR, 1.5 bath. Finished basement, driveway. 1st floor studio. Near all shop$615,000 ping & transportation. Beautiful 1st floor two bedroom condo located in Heartland Village. It has been renovated and freshly painted. This condo has a very low maintenance fee. Near Mall & buses.